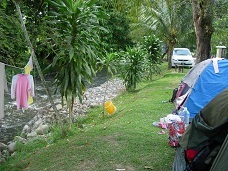 Camping by the river at D 'ark Resort 09- 233 0031/0193. 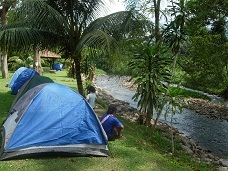 RM40 for a 4-man-tent. 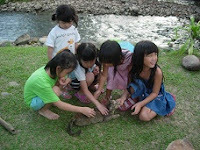 Resort Facilities charges are RM10 per adult and RM5 per kid above 4. The environment is a total opposite from Hutan Lipur Sg Congkak. 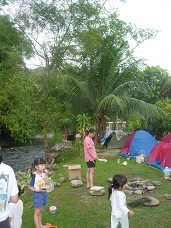 The camping area is so clean and breezy and located adjacent to D'ark Resort where we could conveniently walked in to use the toilets and washing area. Left- camping site on a nice grassland. Right- However, the river bed is full of slippery, mossy rocks which are used for creating rapid. 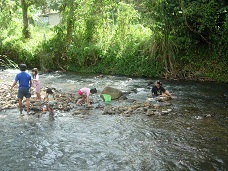 As a result, we have to roam carefully in the river to maintain our balance. 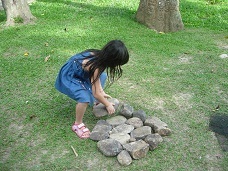 On a brighter note, it creates a different terrain for kids to explore. Eventually, En did not need assistance crossing the river and was able to walk thru it at ease. 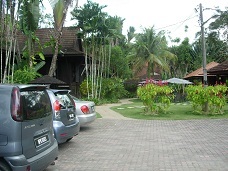 Left- the entrance of D'ark Resort is just opposite the white car. 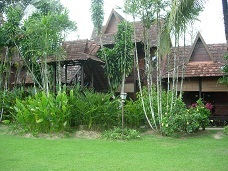 Right- D'ark Resort chalets, a very palatial kampung style resort. 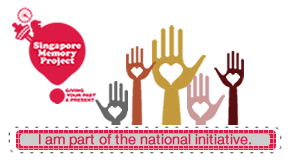 Rates ranges from RM149.50nett to RM287.50nett per night. Parking spaces in front of D'ark where we parked out cars. 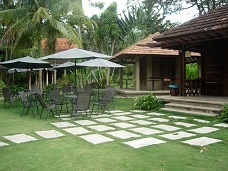 :) We are also allowed to use the tables and chairs at their compound but we prefer the grass and river instead. 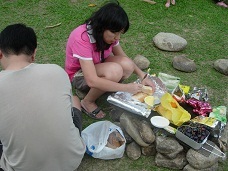 Left- hubby&wife team slicing baguette, preparing garlic bread, with no garlic! Right- Cracking coconut which was plucked from the coconut trees next to our tents, with a rock! The juice is so yummy-licious. 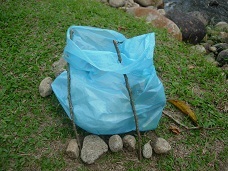 Left- En's rubbish bin. Right- the lucky cat, belong to D'ark enjoying a free massage from kids. 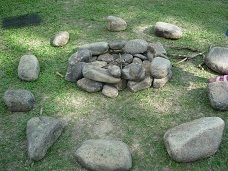 Left - Starting fire! 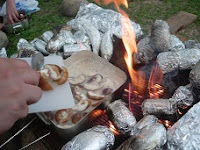 Right- and our fresh shitake mushroom soup along with baquette, corns, sweet potatoes and potatoes. wow! A D'ark staff offered to install light for us when the sun was setting.Two thumbs up for D'ark 's service with a smile:) Right- wooden plank as table. Right- little Hui woke with the birds, yawning. It rained at 11pm till 130am. We have to zip up the tent. Hui cried as it was stuffy and hot. Thankfully, she slept soundly after that. Our tent leaked at most corners and my pjs were wet. We have to use all the sleeping bags to line the floor. What an experience! 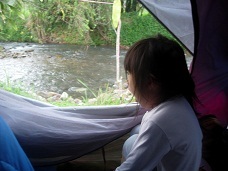 Nevertheless, I enjoyed the cool fresh air, listening to the sound of river flowing and finally went to slumberland. Wonderful night, living out in the open air! 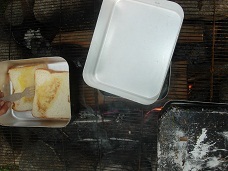 In the morning, thanks to aunty mey who set fire for us to cook our breakfast. 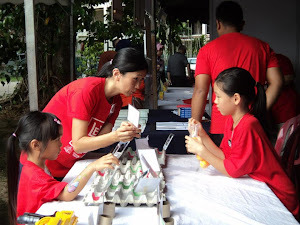 I am new homeschooler mom, can i join your playgroup or any other gathering? I love the river, is not deep. Is clean and calf deep. I was sitting on one of the rocks in the middle of the river. The water is cooling and very relaxing. I got "lost" on several occasions while doing that. EnHui played till they drop in the tent. 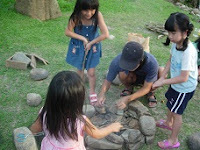 I enjoyed the fire and the cooking and with the children running about. It was a carefree outing. 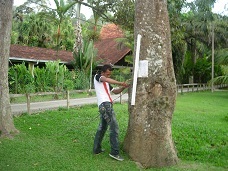 Yeah that;s me giving assistance in trying to break open the coconut. 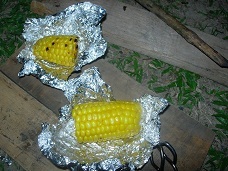 Thanks to Mey, our fire-starter, coconut cracker, and firewood collector, without her (YES is a her), we would have starved to death. He he he. Oh she is also the sizzling hot tuna french-toast maker. The great thing about roughing it outdoors is that the kids can turn the place upside down and it is outdoors. Water can be spilled, hands and feet can be muddy, and hey the children can "wee-wee" 10 times for the whole place is a toilet. The children created so many plays. And laughter, discussion, talks, negotiations, and pleading...are among the things that they do amongst themselves. I thought the children were just great. And then, I am getting use to sleeping in the tent. The children got use to it pretty fast. Hey, Shannon got use to it very fast too. Yeah, it is very relaxing, in a way. The next piece I need to get is an air-pillow for my next trip out. This camp site sound interesting. 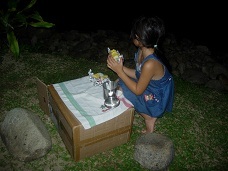 May i know how to contact the resort in order to book the campsite?